Photo Provided During the month of February, the public is invited to stop by Artsbridge to see the woodwork of local artist Gregory Sams Sr.
PARKERSBURG — During the month of February, the public is invited to stop by Artsbridge to see the woodwork of local artist Gregory Sams Sr.
Artsbridge is located at 925 Market St. and the lobby hours are Monday through Thursday from 9 a.m.-4 p.m.
Sams is a lifetime resident of the Vienna/Parkersburg area and a Parkersburg High School graduate. He attended Fairmont State College from 1974-78 on a football scholarship. Sams worked at Diamond Glass until its closing in the late 1980s and went to work in Winchester, Va., to build townhouses for J&R Builders before ending up at Blue Cross & Blue Shield in Parkersburg from 1987-2009. He is married to Connie (Farnsworth) Sams and he is the father of 6 and grandfather of 9. 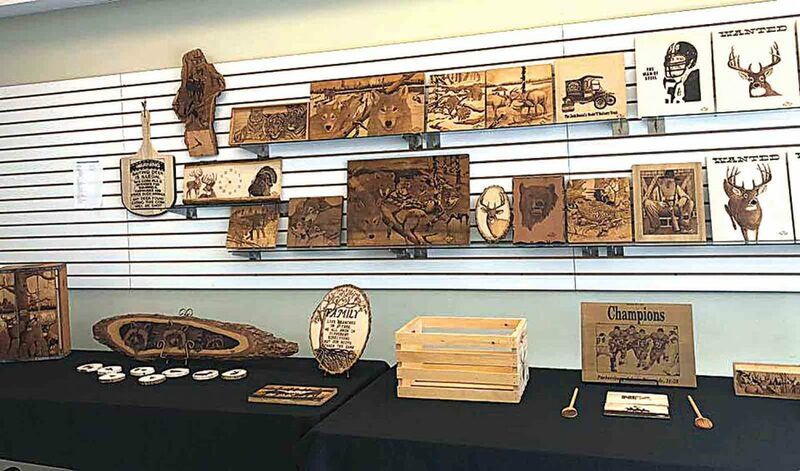 Sams has been doing Pyrography for 34 years and he has work on display from all throughout his woodworking career. Pyrography by definition is the art of decorating wood with burn marks resulting from the controlled application of a heated object such as a poker. It is also known as pokerwork or wood burning. The term means “writing with fire”, from the Greek pur and graphos. For more information call the Artsbridge office at 304-428-3988.